time was, if you were serious about road-riding - and i'm well aware that the advent of the 'mamil' has altered the definition of the word 'serious', in this context - your bicycle wheels would be fitted with tubular tyres, painstakingly festooned with glue, before being stuck to the rim. without the ability to simply slip a new tube inside, should a puncture be suffered in the pursuance of one's business, it was necessary to have a third, ready glued 'tub' stuffed under the saddle. it all sounds a bit of a faff nowadays, and no doubt it was precisely that at the time, but with no viable alternative, the world's population of roadies doubtless considered it yet another necessarily acquired skill. though that particular skill is one that i admittedly do not possess, having arrived at the road-bike as a part of the 'clincher generation', i get the distinct impression that fitting clinchers was almost seen as an admission of a possible dilution of effort. but these are changed days. the tubular still survives in little retro pockets among the cognoscenti and still features with a substantial presence in the pro peloton, but even there, things might be changing. i am insufficiently well-informed to know how many, if any, of the professional teams ride on clinchers, but i do know that several have exchanged their tubulars for the new kid on the block: tubeless. and when i say 'new', i use it as a relative term. and, along with this change in tyre technology, comes a substantial change in tyre width, eased and welcomed by the now almost ubiquitous disc brake. 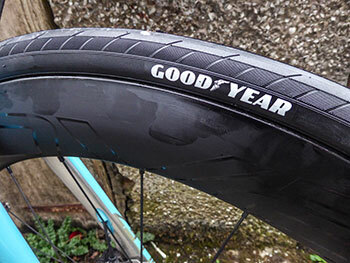 to come ever-so-slowly to the point, in order to review a pair of tubeless-ready carbon wheels (which will be the subject of a future review), the fine fellows at paligap were kind enough to send over a pair of goodyear eagle tubeless-ready tyres. 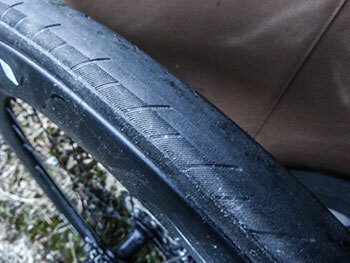 having decided to re-enter the bicycle market around twelve months ago, goodyear now offers this particular road model in four widths, from 700x25 to 700x32. ever the conservative follower of trends, i requested the 28mm width, but with these temporarily out of stock, i was sent the 30mm. 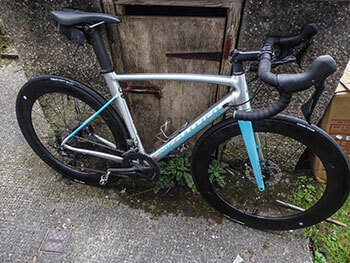 though my ritchey logic promises that such a width is within the bounds of possibility, in this case, the tyres and wheels were fitted to the specialized allez comp disc, which, with its shimano 105 hydraulic discs, offered vast amounts of clearance. even the 32mm would scarcely have troubled fork legs or seat and chainstays. as the variety of factory-built wheels expands, so does the number and variation in tyre availability, both clincher and tubeless. in this particular case, the option to fit the goodyears as clinchers was seen to be missing in action. the carbon wheels mentioned above, feature a 64mm deep carbon rim, one that could scarcely offer access to the valves on an inner tube without use of extenders. the wheels arrived with tubeless valve stems already fitted, so 'twas merely a case of fitting the tyres and heading into the wide blue yonder. however, i have fitted enough new tyres in my career to know that the word 'merely' is often a darned sight more strenuous than its simplicity would imply. though your own process might vary slightly, to fit tubeless tyres, i generally put washing-up liquid along the tyre bead, which not only eases the tyre onto any rim, but helps with the seating process. it is then necessry to give the track pump a couple of swift, hard pushes to 'blow' the tyre beads outward onto the rim edges allowing it to be further inflated. this generally seats the tyre properly, after which the valve core needs to be removed and sealant gloop poured inside, not only to finish sealing the bead to the rim, but to fill any subsequent, small holes that might be incurred during one's perambulations. if you do this in the kitchen a) make sure mrs washingmachinepost is away for the weekend and b) place some newspaper on the floor under the tyre. that gloop has a tendency to wander. overall, fitting a set of tubeless tyres is accompanied by a great deal more faff than sticking a tube inside and inflating to pressure. whether they offer realisable advantages, such as a reduction in weight, depends on your point of view and appetite for gloop lubricated faff. the goodyears occupied their place on the carbon rims with relative ease; just as well, because i failed to note the direction indicators on the sidewalls (yes, on both) and had to turn them round. inflating to pressure was pretty straightforward; with 30mm of width to deal with, i chose to stop at around 85psi (5.8 bar), a pressure that seems to straddle the fine line between rolling resistance and comfort. 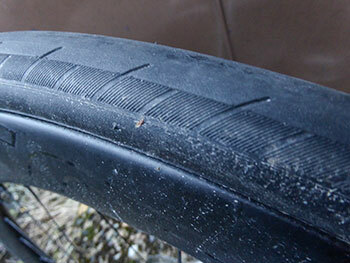 it did take one or two re-inflations to have the tyres seal properly and retain the set pressure, but that seems a common occurence on tubeless tyres. so, what are they like? i'm not naive enough to consider a few hundred kilometres as the ultimate test for any pair of tyres. for starters, there's no way to gauge the expected wear rate, or any number of other untoward details that might raise their heads under normal and not so normal conditions. admittedly, this particular pair will never be subjected to the vicissitudes of competition, but i tend to think the majority of purchasers are also unlikely to race. happily, in one sense at least, islay is currently peppered with crumbling and potholed single track roads, occasionally punctuated by less than pristine cattle-grids. if ever there was an ideal playground for the intrepid tyre reviewer, this could be it. the tread pattern would seem to offer the best of both worlds, providing a smooth centre portion, bordered by more tactile edges to grip the road when cornering hard. as mentioned above, it's a bit early in the process to provide concrete answers to any questions you, or i, might have concerning the veracity of their constitution, but i can testify as to their superior grip. carbon wheels with 64mm deep rims have a distinct tendency to catch the wind, particularly when inadvisedy ridden in galeforce crosswinds. just such an occurrence took place during the second outing on the eagles; emerging from tree shelter into an opening, rider and bicycle were caught unawares by gusts in excess of 35mph, necessitating a brief period of riding at an angle not to be recommended to the faint-hearted. while the road surface was sufficiently unkempt to offer considerable grip, preventing the entire house of cards from coming to an unfortunate end, the damp, slippery metal cattle-grid midway along the open road was a different proposition altogether. not for a long time have i been so grateful for the vice-like grip offered by goodyear's use of all-season silica. given that these are still the early days of march, i have yet to ride with an absence of an infernal atlantic wind. in fact, i've had little in the way of opportunity to ride on dry tarmac either. those 30mm offer a confidence in the heat of battle that is more than welcome, particularly at present when strenuously trying to mitigate the often scary part of riding deep rimmed wheels in galeforce winds on wet roads. i plan to offer an update when more kilometres have been travelled, but if you can't wait that long for a decision, i see little reason as to why these would not provide you with as much comfort and confidence as they have, so far, offered yours truly. 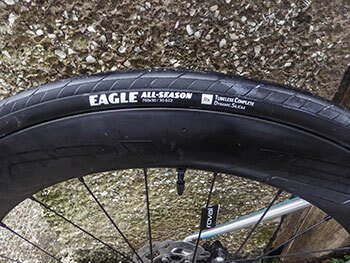 goodyear's all-season eagle tubeless tyres are currently available in black only, in sizes 700x25c, 700x28c, 700x30c (as reviewed) and 700x32c. price is £60 per tyre. the price does not include either valve stems or sealant, the latter, depending on brand purchased, usually costing more than an inner tube.